Ultimamente no he podido dedicarme a escribir en mi blog. Estoy intentando encontrar el tiempo y la motivacion. Sigo leyendo. Este articulo es un ejemplo de como las oligarquias gobiernan el mundo y, si bien parece una verdad de perogrullo, muchos dan vueltas y vueltas para encontrar respuestas cuando las mismas son muy faciles de encontrar. For those of us who recognise both that the Oligarchy is firmly in bed with Big Oil, and that the root of America’s difficulties with the whole Russia/Crimea/Ukraine and America problem is down to good old fashioned petro-dollars, need look no further than here. 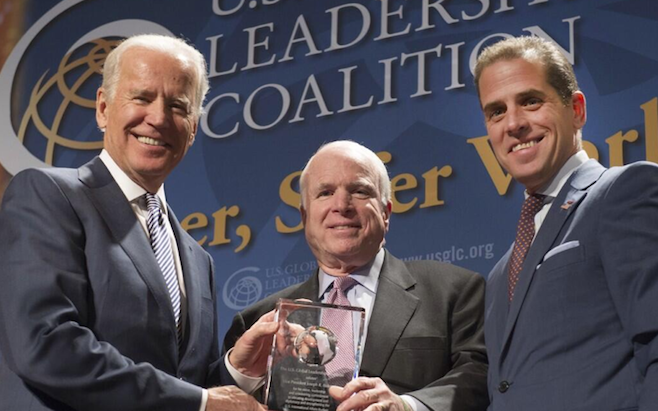 The youngest son of U.S. Vice President Joe Biden, Hunter Biden, has been appointed head of legal affairs at Ukraine’s largest private gas producer — a move The Moscow Times tells us with a straight face would benefit Ukrainians and the country’s economy. We saw earlier in John Helmer’s article which I used here how much American oil interests are bound up in this whole Ukrainian business.